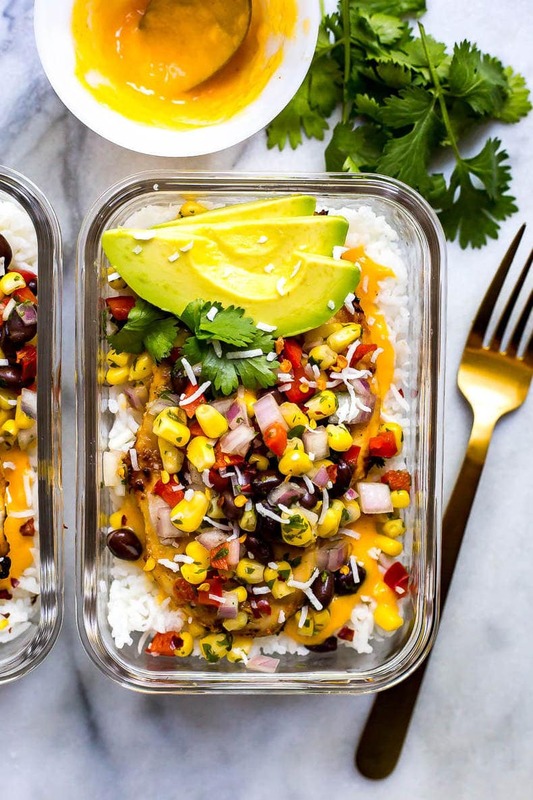 These Coconut Mango Chicken Meal Prep Bowls with basmati rice, corn salsa and an easy mango marinade are a delicious way to prep your lunches for the week! My latest obsession is adding coconut to savoury meals. OMG. TO DIE FOR. Specifically, sweetened shredded coconut. There is something about the hint of sweet combined with the nutty flavour of basmati rice and my super easy mango chicken sauce that I am just here for. I can't get enough. And did I mention you'll be using the BBQ for these meal prep bowls? 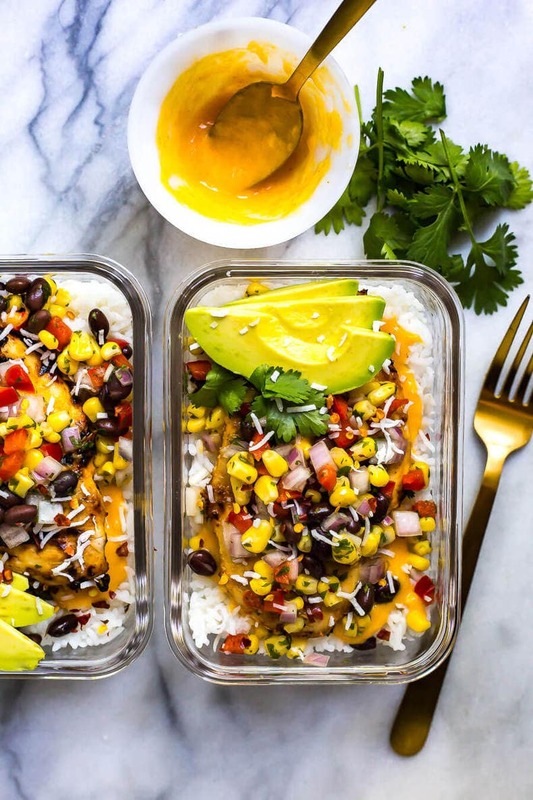 I might just drown in these Coconut Mango Chicken Meal Prep Bowls, they just scream summer. Something I've been doing a lot of lately now that it's summer is doubling whatever marinade I've made (like in these Pad Thai Meal Prep Bowls) and saving half for the actual meat I'm grilling, and then using the other half as a dressing or sauce. I swear, it takes years off your meal prep time and you also get to enjoy a ton of flavour in whatever you're making. 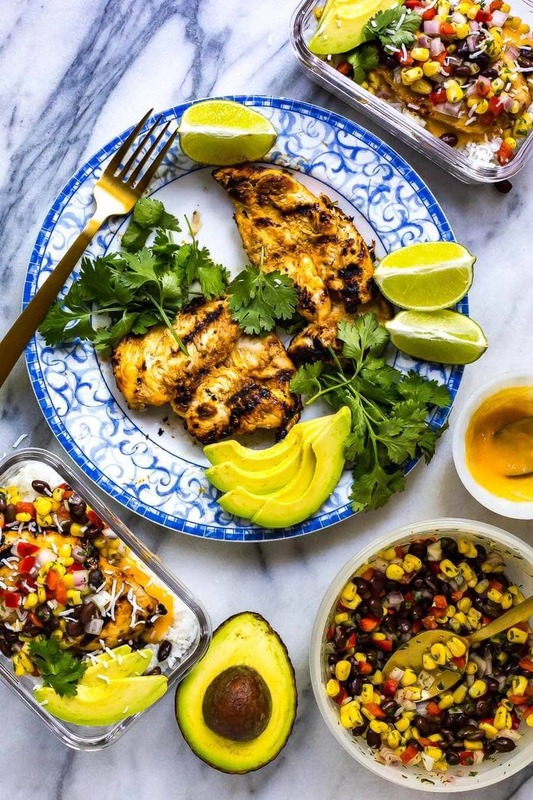 IMPORTANT: when saving half your marinade, you want to make sure to mix the marinade ingredients in a bowl separate from the chicken FIRST so as to avoid contamination. Divide the mixture in half, save the uncontaminated version for after you're done cooking everything, and the other half for marinading the chicken. Safety first! I also included a super easy and delicious corn and black bean salsa with red pepper and cilantro to top the chicken in these bowls, and garnished with some sliced avocado. Because every bowl should come with avocado, okay. That's gonna be my new meal prep rule. If you want your avocado to stay in tip top shape, I recommend buying one that is still super hard and will ripen as the week carries on. As a food photographer, literally the hardest part of my job is picking out the perfect avocado for photos. I'm actually so dramatic, but you get it. Basically, try to pick the firmest avocado you can while ensuring a tiny bit of softness so you can slice it up and pack it in these bowls for the week. I usually find it's fine for 4 days or so if you slice it up just at the point where it's about to ripen. 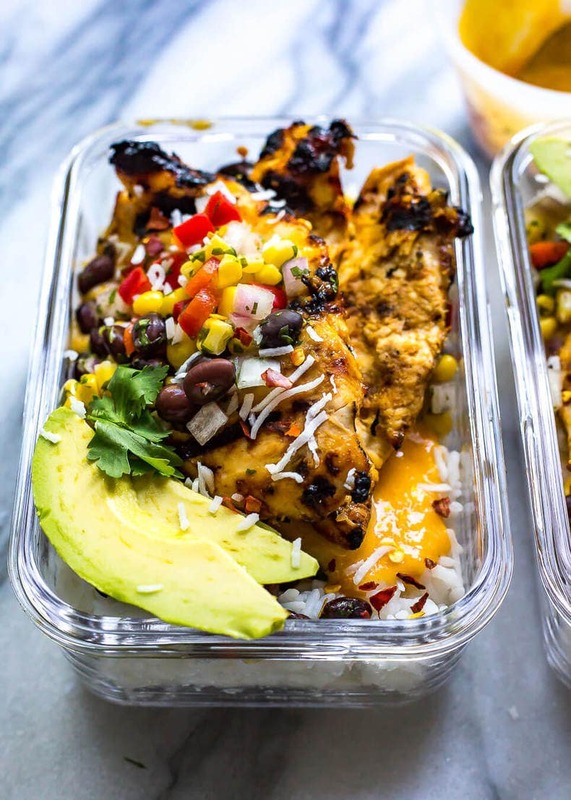 Part of the trick to making these Coconut Mango Chicken Meal Prep Bowls in a pinch is also having the right equipment on hand and knowing when to time everything. I used a rice cooker to cook jasmine or basmati rice while I made the mango sauce in a Magic Bullet (single serving size blender). You can also cook the rice ahead of time up to a day or two. From there, I marinated the chicken in a plastic bag for 10 minutes, reserving half the sauce to pour overtop of the cooked chicken and rice afterwards. While the chicken was marinating, I tossed the ingredients together for the corn salsa (basically defrosted corn, black beans and chopped red pepper and onion with a bit of cilantro and lime juice) then I threw the chicken on the BBQ. When you cut the chicken breasts in half lengthwise, you can cook them for half the time you would normally need – maybe 4 to 5 minutes each side if that. So quick and easy, and my favourite new way to BBQ chicken! If you don't have a BBQ, no need to worry! You can cook the chicken the same exact way in the oven – just let it cook in the sauce in an ovensafe dish for 12-15 minutes until the chicken is fully cooked. I've listed the alternative instructions below! 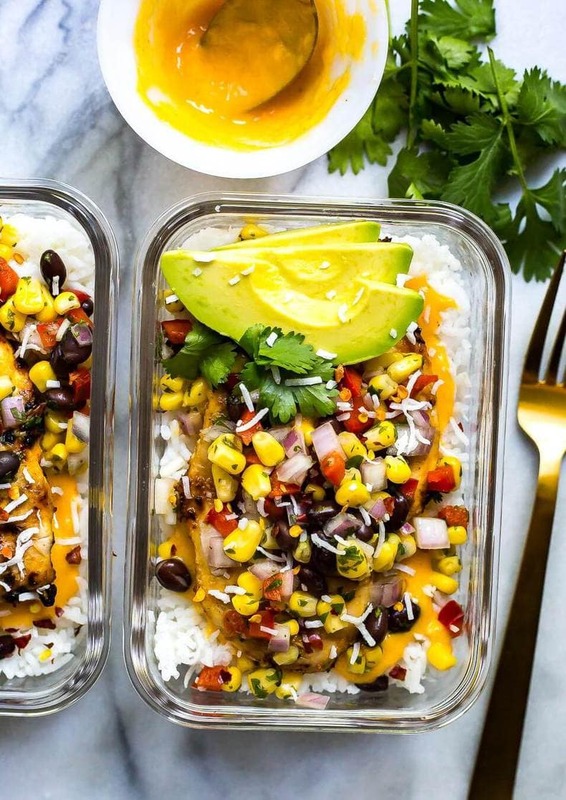 Divide the rice among four square glass meal prep bowls (I get mine at IKEA), top with two slices of chicken, the extra sauce and the corn salsa then sprinkle some coconut and extra cilantro overtop. Boom, lunch for the week is ready and you're gonna love yourself for it! And it feels like such a gourmet meal too! 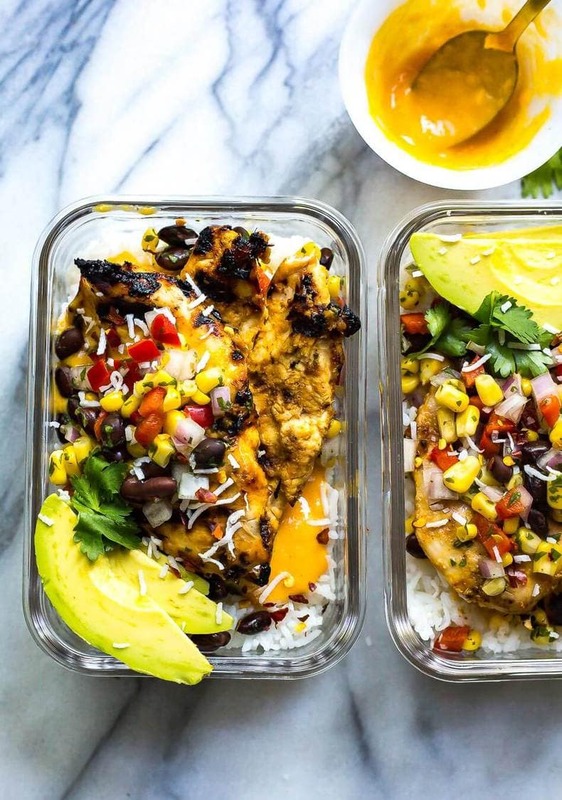 Will you be making these Coconut Mango Chicken Meal Prep Bowls? Get your square glass meal prep bowls here! Stock up on jasmine rice while you're at it. Preheat BBQ to med-high heat (alternatively, preheat oven to 425 F). Cook rice in a rice cooker according to package directions. Blend ingredients for mango sauce together, then marinate chicken (each breast sliced in half lengthwise) in half of mixture for 10 min. Meanwhile, mix together ingredients for corn salsa. Add chicken to grill and cook for 4 min per side. Remove from heat. Divide rice among four glass meal prep bowls. 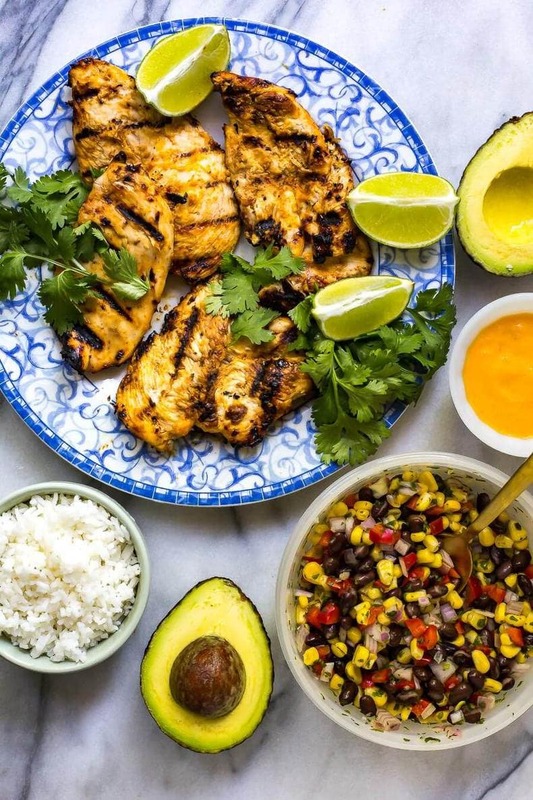 Add 2 pieces of chicken to each bowl (there should have been 8 slices total) and top with extra reserved mango sauce, corn salsa, shredded coconut and extra cilantro. Add slices of avocado and refridgerate up to 5 days in the fridge. This looks so good. Perfect for summer eating. Just made this for lunches this week – it’s incredible! I needed to stop myself from eating more, or I wouldn’t have any left for lunch! Tanya that makes me so happy!!! These are definitely my go-to lunch bowls! Wait, this is amazing. But I’m so confused – or maybe have no sense of common sense. How much bbq? Am I just not seeing this in the ingredients? Am I supposed to just heat up some bbq or should I be marinating my chicken in it. IDK. Let me know. Hi Leila! I recommend cooking the chicken on the BBQ for this recipe (no BBQ sauce!) but have listed alternative directions for the oven. Hope that helps! I’m sorry, do you eat this cold? Or do you heat it up? Thanks. Hey Katrina! I warm them up but you could eat them cold! Made this last night they were so good!! Thanks for this great recipe!! Thankyou, I am new at meal preps. I love the taste it’s loud, bold and colorful. Made this for supper and am having leftovers for lunch right now. Fantastic! I tried your Korean chicken and it was great too. My daughter recently showed me your site. Can’t wait to try more recipes! Thank you! Oh I am SO HAPPY to hear that Dianne!!! I am so happy you like my recipes so far – please let me know if I can be of any other help! This looks really good. Do you think you could use frozen mango if fresh isn’t available? Hey Jayne, thank you! Yes, you should be able to 🙂 Just defrost it first! Hi. Where are the alternate instructions for if you don’t have a BBQ? Hey Nicole..unfortunately I can’t provide alternative directions for my recipes. You should be able to saute the chicken on the stovetop though, it would be an easy swap. About the same cook time too! This recipe its absolutely amazing!!! I really cant even describe it! I made this last week and forgot to comment. Even though its still freezing in NY, I love eating “summery” foods all year long. My husband doesn’t like coconut so he had his without it and he couldn’t stop saying how delicious it was. I have told EVERYONE about this recipe. Thank you!!!! My daughter just finished making this recipe. She is working a contract job and staying with me for a month. Instead of buying cafeteria food at her work, she now has homemade food to take. She had me try it and it was wonderful. I will be making it soon for my husband. Thanks for sharing. Been meal prepping lunches for a few weeks now and this is by far the best yet! Even Hubby agrees. I added a chopped jalapeno to the salsa for an extra kick!